Diamond Fun Casino are available for bookings literally anywhere! 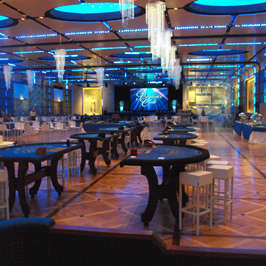 Recent trips abroad to supply our fun casino to international guests include the Rome Cavalieri, a Waldorf Astoria Hotel and Italy’s leading business hotel. So when it came to booking a luxury fun casino by a prestigious overseas client we were the best choice. Our tables looked absolutely stunning in the ballroom. The event was also complimented by our close up magician and giant 6 lane Scalextric. Our entertainment certainly stepped up to the mark in this absolutely beautiful and stunning venue. 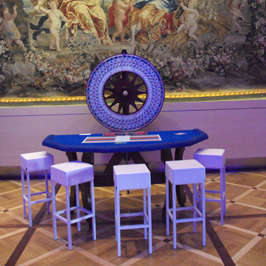 Switzerland was another recent destination we supplied our luxury casino tables for. 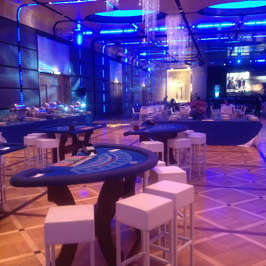 A trade exhibition needed some sparkle for the evening’s entertainment and we achieved this providing a mix of Blackjack, Roulette and Stud Poker tables which were played on by the clients with the background music of our live ratpack style singer. Whether your event is in this country or elsewhere in the world you can rely on us to provide a top class service no matter where the venue is. Where language is a potential barrier, we will supply our multilingual croupiers, who are accustomed to worldwide travel and have provided croupier services to clients from many different cultures and countries.